At that time, Jesus saw a great multitude, and was moved with compassion toward them, and He healed their sick. And when it was evening, His disciples came to Him, saying, “This is a desert place, and the time is now past; send the multitude away, that they may go into the villages, and buy themselves victuals.” But Jesus said unto them, “They need not depart; give ye them to eat.” And they say unto Him, “We have here but five loaves, and two fishes.” He said, “Bring them hither to Me.” And He commanded the multitude to sit down on the grass, and took the five loaves, and the two fishes, and looking up to Heaven, He blessed, and brake, and gave the loaves to His disciples, and the disciples to the multitudes. And they did all eat, and were filled: and they took up the fragments that remained twelve baskets full. And they that had eaten were about five thousand men, beside women and children. And straightway Jesus constrained His disciples to get into a ship, and to go before Him unto the other side, while He sent the multitudes away (Matthew 14:14-22). It has been said more than once in this holy church that when the Apostles were with their Divine Teacher, the Savior, it was a time of spiritual education for them, when the best of Teachers, the Lord Jesus Christ Himself, prepared them for the great ministry they were to accomplish upon the earth. From the lessons that the Lord taught them, we often see in the Gospel that He taught them to rely wholly on His all-powerful Divine power and help, never considering any circumstances to be hopeless, but to remember Him, His omnipotence, and His love. The Apostles said: “We have five loaves and two fishes, but what is that for so many people?” The Lord said: “Tell them to sit down in rows.” They sat down in rows on the grass. The Lord blessed five loaves and two fishes, giving them to the Apostles to distribute to the people. And this tiny amount, compared to the mass of people, not only filled everyone, but more pieces of bread remained than there had been to begin with. This amazing miracle should have reminded the Apostles again that, if they have faith, they should not fear anything or consider any circumstance to be hopeless, for in their faith they have the support and help that can help them everywhere and in all things. Recall that the Lord soon repeated this same miracle. Again there was a mass of people, again the Lord fed them all, and in all else the miracle was the same. The Lord performed it twice, so that the Apostles could properly discern the truth that they could rely wholly upon Him and that He could make much from little. Recall the Gospel narratives – there were also two of them, very similar to one another – of the miraculous catch of the fish. When the Lord asked the Apostles what they had caught, they replied: “Nothing!” They had labored all night without any results whatsoever. But when they cast their net following the Teacher’s word, they caught such a mass of fish that it was difficult to fit them into a single boat. They took two boats, which began to sink. And – take note – when the Apostles endeavored to do something on their own (and they were professional fishermen who knew what they were doing), they labored without result. Then the Lord said to the Apostle Peter: “Let down the net on the right-hand side of your boat, and you will catch fish” – and they caught a mass of them. Of course, we do not know exactly how this happened: whether the Lord’s almighty power arranged it so that a mass of fish would appear or whether these fish suddenly swam there simply by God’s Providence. 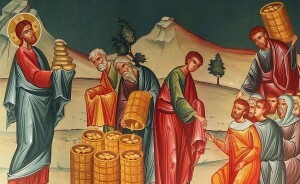 Either way, the Apostles saw here another example of how their Teacher would help them if they would only make use of His help, which is obtained by faith. After all, we know from the Gospel that the Lord, when performing His wondrous miracles, time and again said to the people: According to your faith be it unto thee – that is, in accordance with your faith will you receive the Lord’s mercy. Therefore, the faith of the human heart is, as it were, the key to the entire treasury of God’s beneficence. One still encounters people of strong and real faith, although rarely nowadays. During the years of the revolution, in Yugoslavia, Russian workers were working on a certain building when a monk from a monastery approached them. They noticed what a luminous and noble countenance he had. 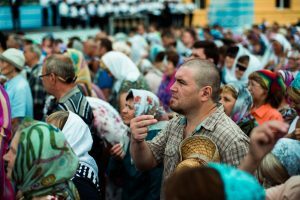 He began talking with them, pointing out that everything is possible for the believer, now as in the past, and demonstrated this by an amazing experience. Where they were talking there was a waterfall that roared and thundered. This monk, by the sign of the cross and the name of the Lord Jesus Christ, stopped the waterfall. The workers froze in amazement. And then, once again with the Lord’s Name, he set the waterfall back into motion. He began to say that, where there is faith, the Lord’s word will be fulfilled that one also can move mountains. But we, unfortunately, are of little faith. When the Apostles felt that their faith was weak and lacking, they began to ask the Lord: Increase our faith! For they understood how powerful faith is and how much depends upon it. All the more so should we, who are of little faith and spiritually poor, also pray that the Lord would increase our faith and make us really, truly, and sincerely believing Christians. Amen.